Last night I had the pleasure of having a wonderful guest over for dinner. Erica came laden with a box containing a lovely Adoro Sauvignon Blanc wine that paired fantastically well with my starter of chilli crumpets served with crayfish and caviar. Erica stuck with the white and Dave and I moved on to a red for the main course and then the cheeses came out. We had left them sitting pretty on the kitchen counter while we ate so that they were at room temperature when we started our journey with the Adoro Mourvèdre. The first nose of this wine for me is of raisins – beautiful and rich and already had me wondering how it would pair with the cheese. We started the tasting with a Tomme Obiqua cheese from Natal. This unpasteurized jersey milk cheese is made in a brushed rind style and has a mild but complex taste and creamy texture. Frankly, the wine did nothing for the cheese, other than making it chalky. We moved on to a Camembert from France – it was young and oozing flavour, and here the wine started its magic. Our next taster was a blue Brie from Fairview and again, the wine complimented this cheese. Then, we tasted an Italian Gorgonzola and the wine was awesome. It made the cheese taste better and creamier and I was thinking, could this get better? Our last cheese was a very strong South African Gorgonzola and here our taste buds started to differ. I loved it, but Dave was not super impressed. Then, my mind started on a journey – if the wine worked so well with cheese, how would it pair with chocolate. The press release states that the off-sweet profile will also work with a sweet dessert. I hauled out a bar of Lindt Chocolate – with a liquid blueberry and lavender centre and my taste buds started singing – this really works. Not stopping there, I got the preserved figs Gaby had given me as a gift and both Dave and Erica tried these with the cheese – this however did not work. The next taste journey was the Gorgonzola with a gooseberry jam – home made from Houw Hoek farm stall and the resounding answer to the question is YES, this is a fantastic pairing. The wine lifts the taste of the cheese and the jam, without being over shadowed. This beautiful wine will be adorning my table for many a different meal – gnocchi served with a Gorgonzola sauce comes straight to mind as well as a rich chocolate mousse. The pairings in my mind are endless but make sure you have a cheese that can stand up to the beautiful notes of this wine. Ian Naudé (the wine maker) chose Mourvèdre for its flavourful, elegant fruit, robust enough to retain its flavour irrespective of harvest date; with ripeness resulting in a “huge concentration” of berry and cherry notes. He chose the Swartland area whose climate, he says, is the twin to Spain – the cultivar’s point of origin. Was so lovely tasting the wines and cheeses with you, Tandy! Such a beautiful write-up as well – you have remembered everything perfectly! 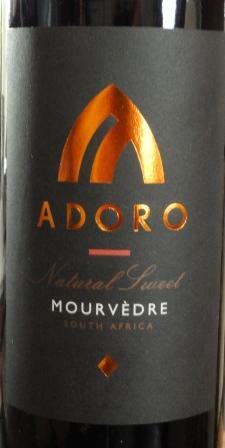 It truly is a beautiful wine and I knew at the Joburg Tweet&Taste event that you would be blown away by it. I’m so glad you have met Erica and predict a long friendship, you are both such amazing ladies. You rock! Are you going to blog the starter recipe? You are a wonderful friend and such a support to me!